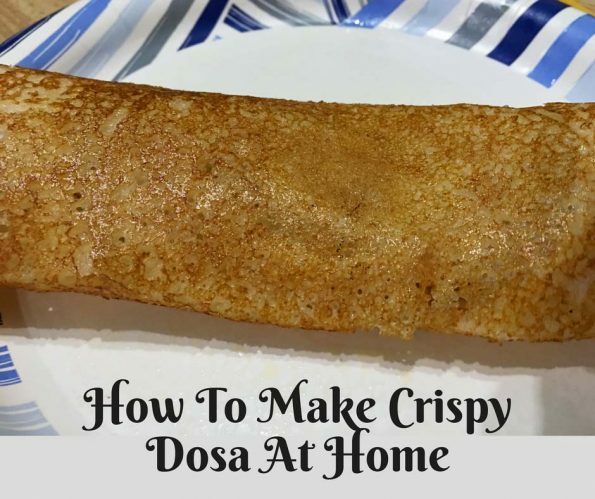 This post on how to make crispy dosa gives you tips, ideas and also a simple crispy dosa recipe to help you make crispy dosa at home easily. 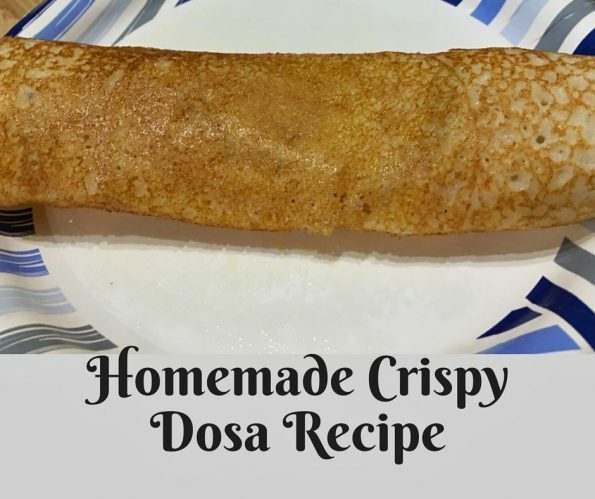 Crispy dosa recipe is so easy and you can make delicious and kid friendly thin crispy dosas using regular dosa batter made at home. See my blog post on plain dosa recipe if you are not familiar with dosa. To make crispy dosa, we use regular dosa batter which is slightly more thinned out than idli batter and we use ghee to make this thin crispy dosas. So this is basically a homemade ghee roast recipe, following which you can make thin and crispy dosas at home. The restaurant style ghee roast mostly come as large dosas, however when we prepare the crispy ghee roast at home, it is much easier to make them in regular small sized dosas. By using ghee you can easily make thin and crispy dosas which is very delicious with the flavor of ghee. Make sure to use good quality pure ghee to make these dosas. If you don’t want to use ghee, you may also use coconut oil, good quality sesame oil or any other vegetable oil if you like. However ghee and sesame oil are the best for making dosas, if you use any other oil, the flavor and results may not be the same. As I mentioned, try this crispy dosa recipe with ghee, or use sesame oil if you do not want to use ghee. 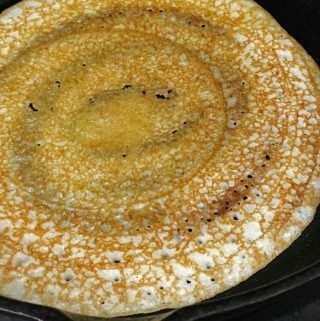 The key to making crisy dosa is to use good quality ghee and also to thinly spread the dosa batter. 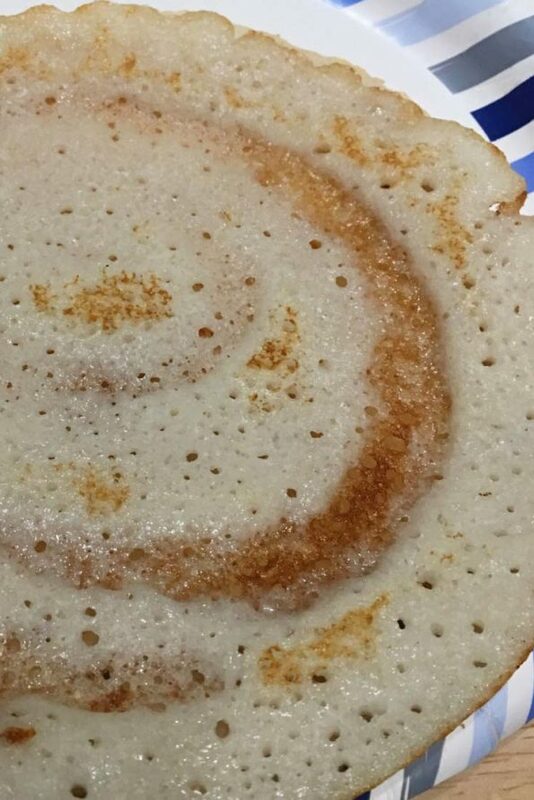 For the best results, use an iron pan to make the dosas. I always like the results better when using iron pan compared to non stick pans to make really delicious crispy dosas. So here is how you can easily make crispy dosa or ghee roast at home following this easy crispy dosa recipe. Simple and crispy dosa recipe will help you to prepare homemade South Indian style crispy dosa for breakfast or dinner! Mix the dosa batter very well without any lumps, keep aside. Heat an iron pan or tawa (you may use non stick pan also), and grease with one teaspoon of ghee or oil. Pour a small ladle full of batter to the hot pan, spread it thinly in circular motion using the ladle itself. 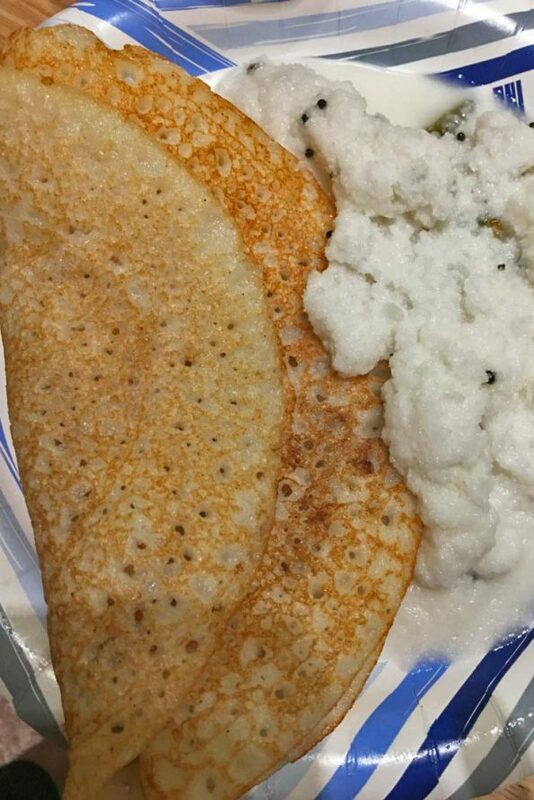 If you spread it thick, the dosa won't be very crispy. As the dosa starts to get cooked, add a tablespoon of ghee to the dosa, almost evenly across the dosa and also on the edges. It doesn't have to be perfect, you can just add the ghee using a spoon, try to do evenly as much as possible. As the dosa gets cooked, the ghee will melt and spread across. Make sure to add a little ghee on the edges, if needed you may use little extra ghee. As the dosa is cooked, the sides of the dosa will start to separate from the pan. 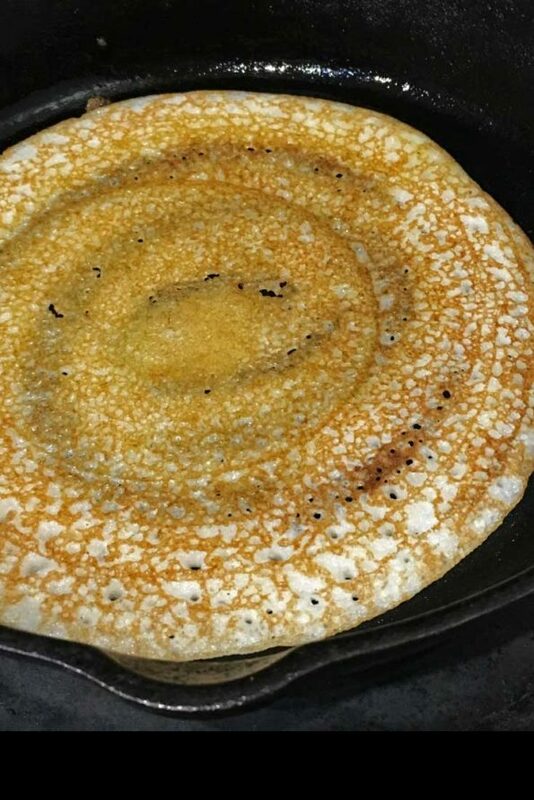 Once the sides start to separate (in about 2 to 3 minutes) using a good quality spatula, gently flip the dosa so the other side will also get cooked fast. Using the spatula, you can help separate the dosa from the pan, starting from the sides and moving towards the middle gently and slowly. Once the dosa is flipped, give another 1 more minute to cook the other side too. Gently transfer the crispy and hot dosa using the spatula, to the serving dish. Similarly cook all dosas until the batter is finishes. Serve the hot and crispy dosa with any sambar, chutney or any vegetarian curry of your choice. Notes: Make sure to serve the dosa hot. Dosa are most delicious when served hot, as it cools down, the texture will change and won't be the best. Hope you found this post on how to make crispy dosa or crispy dosa recipe using ghee helpful in making easy and simple crispy dosas at home.